MediSafe is fully insured to work on all medical equipment. MediSafe has comprehensive product liability insurance that covers all repairs, testing and calibration. In the unlikely event MediSafe is held legally liable, with respect to works carried out on a piece of medical equipment by our engineers, MediSafe is covered up to £1 million per claim. Do you test medical equipment to the correct standards? We ensure devices are checked by a qualified service engineer, using specialized test equipment, to guarantee that the medical equipment is being tested to British Standards and/or to the manufacturers’ specifications. Research shows that current, not voltage is often the source of injury or death, so testing to the standards of IEC 60601-1 is imperative to control the safety of medical devices for the use in the treatment and diagnosis of patients. The quality and outcomes framework is the annual reward and incentive programme detailing GP practice achievements. 3 QOF points are available to practices that have their diagnostic equipment regularly inspected, maintained and calibrated, and have these tests clearly recorded. 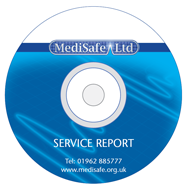 Having your equipment annually serviced by MediSafe, with the provision of a full service report fulfils these requirements. For your convenience, we provide a comprehensive service report package on the day of your service visit, containing a CD with all the data of your current service. Electronic copies will also be stored at MediSafe offices as a back-up record of your servicing details.